Hope everyone had a wonderful Christmas! It's nice to have a white Christmas (and not just have to dream of one). Here is a shot I took last weekend when we got more than 20 inches of snow. 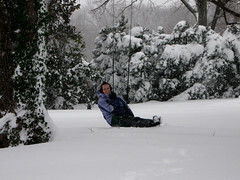 Instead of having lots of leg room for the swing, Jen is sitting on the snow.